Beechwood Interiors have been trading for many years now and below are a few questions we are frequently asked. Whether it is a bedroom, kitchen or home office all rooms have different shapes and sizes, each with unique characteristics such as chimney breasts or sloping ceilings. With fitted furniture your furniture fits the space giving the best look aesthetically as well as providing the best storage options. My Ceilings slope in the room I require furniture, Is that a problem? No, all of Beechwood Interior’s commissions are bespoke to you, your design and your room, therefore we design your furniture around the space including ceiling height and slopes. Do you offer a kitchen, bedroom or furniture design service? Yes, for a fee which is deductable from the final payment if the commission is accepted. Beechwood Interiors produce full colour 3D computer generated plans allowing you to visualise your product before it is manufactured and fitted by our highly skilled craftsmen. We continue to work with you until your design is as you imagined if not better. How much do your kitchens, bedrooms and free standing furniture cost? As all of our commissions are bespoke, pricing is made to suit the project and we try to accommodate your budget in our design. Before works commences along with 3D drawings we create a costing sheet and payment schedule for peace of mind. Do you install kitchens, bedrooms and furniture? Yes, at Beechwood Interiors we have our own team of highly trained installers. Beechwood Interiors work throughout the south of England but do travel nationwide as well as into Europe and America. Do you have a standard range of furniture? No, everything that Beechwood interiors is bespoke designed for you and your space. 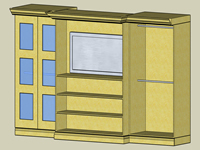 However with kitchens we do offer a range of pre fabricated kitchen units manufactured by MatchMaker. No. Beechwood Interiors do not have a showroom for several reasons, firstly as all of our commissions are bespoke, we design for you therefore you would only see someone else’s design and not your own. Also not having a showroom allows us to keep our costs lower passing the benefits on to you. 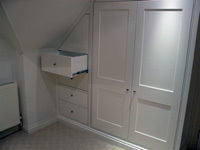 Do you carry out any ancillary work e.g. electric, plumbing, building? Yes. We are pleased to quote for most work and we have a NIC qualified electrician and Corgi registered plumber as well as many skilled builders and decorators as a part of our team. Are Beechwood Interiors using environmentally friendly materials? Our hand selected wood veneers and solid timbers are sourced from environmentally sustainable sources and carry the FSC mark. In addition to this the majority of woods that we use are from temperate sources in the northern hemisphere where there is a plentiful supply. What finishes do Beechwood Interiors Supply? We have our own spray booth where we can spray your furniture, by hand, in any sheen clear lacquer and well as any colour you specify for a painted finish. Amongst the team Beechwood Interiors also have a trained French Polisher and can apply high quality traditional and modern finishing techniques. Beechwood Interiors prides our self on our quick lead time which is currently at 4 weeks from agreement of the 3D computer generated drawings. We hope these answer have been of a benefit to you but if you feel you would like Beechwood Interiors to help you further please do not hesitate to contact us and a member of staff will be happy to assist you.